AIO Day & Night design offers more absorbency with option to add or remove layers. Entirely made of bamboo material to protect baby’s skin from rashes. - Stay-Dry Side (charcoal) allows the moisture to go through but maintains a dry feeling next to baby’s skin; great for younger babies. - Cool Side (white) provides damp feeling when wet, helps to get ready older babies for potty training or during hot summer days. Although this is an AIO cloth diaper and stuffing with inserts is not required, it’s now so much easier to align inserts inside the pocket with back and front opening. You can hide all layers to make daycare friendly cloth diapering option. Compatible with EcoAble Charcoal Bamboo Inserts or Hemp/Cotton Diaper Inserts (sold separately). 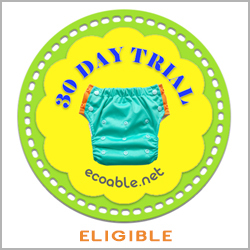 SAFE: EcoAble Cloth Diapers are certified in compliance with the US CPSIA (Consumer Product Safety Information Act) rules and regulations. This diaper has all kinds of customization options. I love that I can put in only one insert. My babe is too small for all of them and it really does make a difference. I'm sure if you have a toddler this would work perfect with all the inserts. It has a very soft cover and the print I received (arrows) is super cute.